For those of you who have been following my blog, you’ll know how much I LOVE my savoury food and tend to dismiss the sweeter things in life. Other than being pregnant the first time round where I craved pain au chocolat fairly regularly, I have never particularly had a sweet tooth. Even as a child I was definitely more of a crisps than sweets gal. However, occasionally, very occasionally, a dessert grabs my attention and makes me sit up and go wow. I had one of these wow moments recently when I was holidaying in Bali. 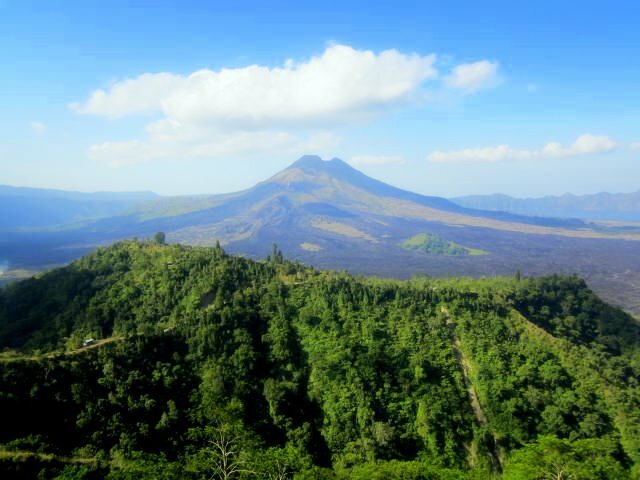 We had stopped to rest for lunch at a restaurant overlooking the impressive Mount Batur, Bali’s largest active volcano. The restaurant offered a buffet service, which allowed Mr B, big A, little Z and me to try a range of authentic Balinese cuisine. Normally I would stop after the mains, but for some reason I was tempted to try a rather sultry and gloopy looking black rice dish, which had a purple crimson hue to it. I don’t know why, because it certainly wouldn’t win a beauty contest, but I think I was curious to see what it would taste like and what the red lumps were exactly (see photo above). 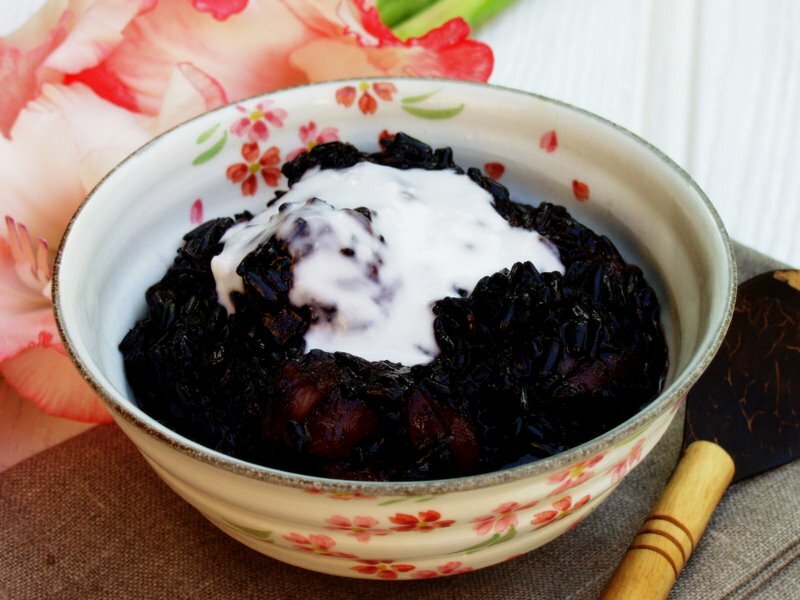 We’ve all had white rice pudding, but black? Settled back in my seat, enjoying the vista I tried a small mouthful and to my utter surprise it tasted REALLY good. I starred into the bowl, trying to figure out why it tasted so heavenly. Within the rice pudding the ‘red lumps’ turned out to be mouthful size chunks of banana, which had been stained deep crimson due to the rice. 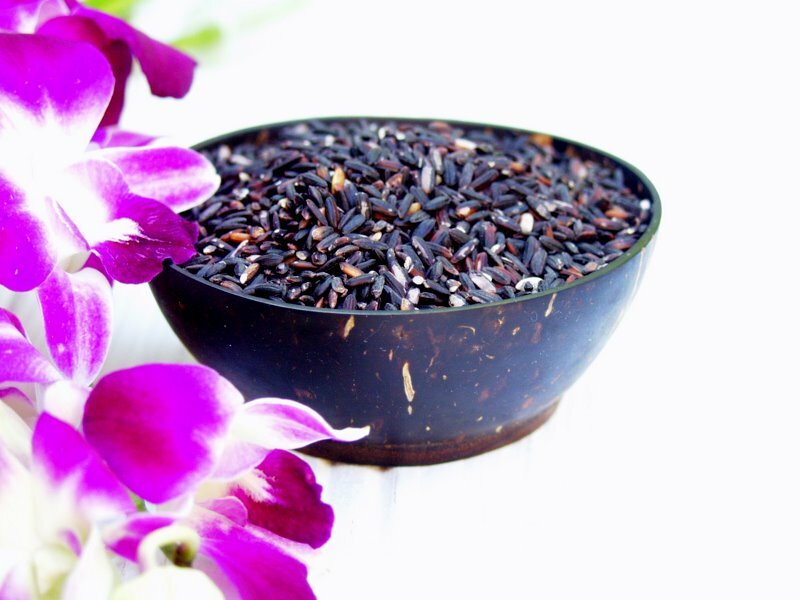 They tasted delicious and worked so well with the chewy sweet and slightly nutty black rice. It was sweet, but not sickly sweet, and I was able to polish off a small bowl. I was so impressed by the dish that I managed to find the chef who had actually cooked it and he talked me through how he had made it. I tend to have a habit of doing this when I eat a dish that is sensational and that I think I can replicate back at home. I figure that chefs must quite like it when occasionally someone takes a great interest in a dish that they prepare. I imagine if everyone followed suit then it would be annoying, but I am hoping that I’m in a minority so they don’t mind telling me! Taking down a mental note of the ingredients, and a couple of photographs as reminders, I left the restaurant completely won over by this understated dessert that certainly packs a punch. I hope you enjoy it as much as I do, and thats coming from a savoury eater! 1. 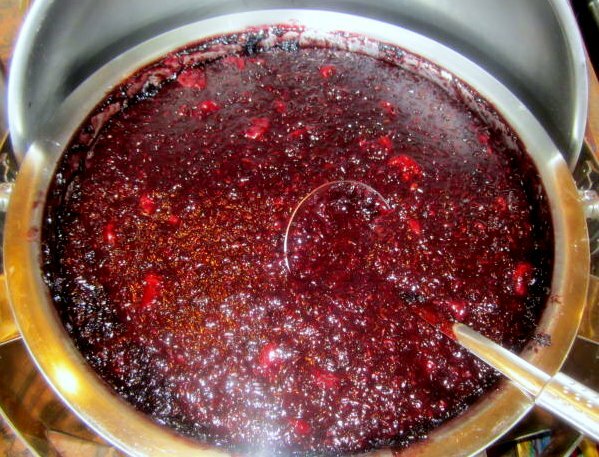 Place the black glutinous rice in a bowl and rinse it through with water a couple of times so as to clean it throughly and dispense of loose husks. Then leave it to stand overnight soaking in water, so that the water is sufficiently above the rice. 2. Empty the water from the rice bowl and place the rice in a pan along with 600ml of boiling water. Simmer gently, uncovered, for 45-55 minutes, stirring intermittently so that the rice does not stick to the bottom of the pan. 3. After 20 minutes, place the chopped banana pieces into the pan, along with the palm sugar (I use granules, but palm sugar blocks would work equally well. As an alternative brown sugar is an option but does not have the same sweet tones of palm sugar). 4. At this stage also add the vanilla from the vanilla pod. To do this use a sharp knife to cut open the pod and then, with a teaspoon, scrap out the vanilla contents. A teaspoon of vanilla essence could be used as a replacement to a vanilla pod. 5. Around 45-55 minutes of simmering all the water will have been absorbed and the rice will be soft. 6. Serve immediately. A spoonful of coconut milk compliments this dessert perfectly. This entry was posted in Desserts and tagged Bali, banana, black rice, black rice pudding, ketan itam, mount batur, rice dish, size chunks, sweeter things, utter surprise. Bookmark the permalink.